Certain riders in the Giro and TdF have been seen wearing new SiDi road shoes, which appear to be labeled “Ergo 3”. The “3” seems odd to me, since the current “Ergo 3” really only differs from the “Ergo 2” and the original “Ergo” by the sole and the heel cup, whereas this new top-of-the-line shoe has an obvious and drastic revision to the whole upper and fastenings. They may as well call it something entirely new (though SiDi has already used the names “Tecno”, “Shadow”, “Energy”, …..) because the changes probably warrant it. The current shoe has a velcro strap over the toe box, a BOA-style ratchet over the mid foot, and a classic padded, ratcheting strap over the instep. The new version has a BOA-style ratchet that handles both mid and fore foot, and a second BOA-style ratchet over the instep combined with a padded cushion. Speculation is that the new shoe should enjoy substantial weight savings, which if true would really enhance SiDi’s already gold standard in the market place. Though widely considered the most comfortable shoe line on the market, it’s no secret that Sidis are heavier than comparable competitors. I’m hot for these shoes. I used to have a pair of the original Ergo shoes, but for some reason the upper rubbed my instep badly. 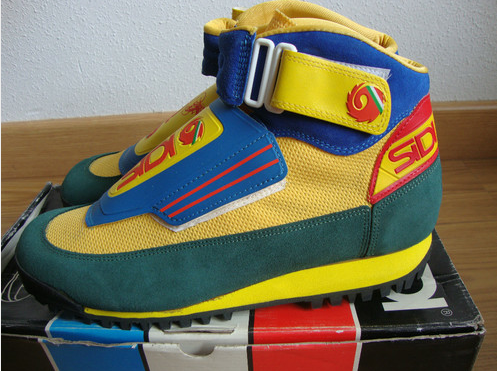 That was the only pair of Sidi shoes to do that. 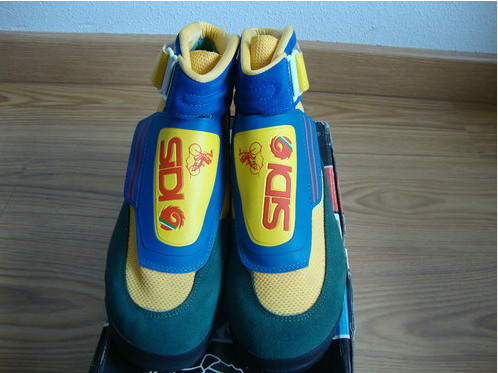 I have had 2 pair of the SiDi Dragon (one of the first version and a “Dragon 2”) which are the mtb versions of the Ergo, and they have been the most comfortable cycling shoes I’ve ever had. I sold those Ergos in the spring, and my only road shoes are some 11 year old SiDi Energy shoes, which are getting a little long in the tooth. No idea yet when these puppies will be available to the public, but Pozzato and Sagan are wearing them already. This implies that they will at least be available in the current Euro favourite colour white and Liquigas’ not-quite-ugly-enough-to-be-cool Skittles green/white colourway. Is it possible for a shoe to go beyond ugly….beyond so-ugly-it’s-cool straight into an ugly so bad it can alter your perception of the world? To find out, go to the jump….or you take the blue pill – the story ends, you wake up in your bed and believe whatever you want to believe. These shoes are currently on eBay. No words are worthy to describe this hideous magnificence . Below is the version that Pozzato wore at the Giro. This version still has the velcro strap over the fore foot.